Bike riding is an important physical and social milestone for all kids to master. 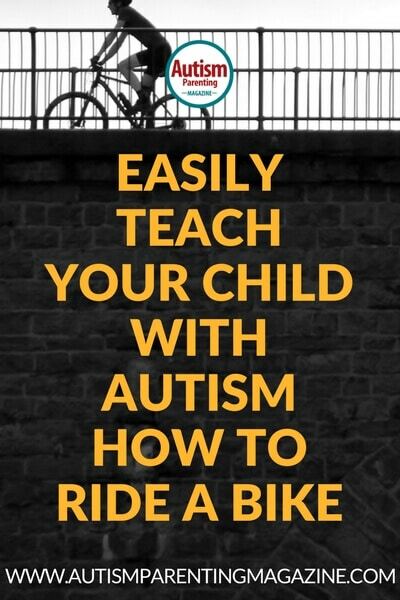 Our kids with autism spectrum disorder (ASD) can learn too. My son has severe autism and is nonverbal. When he was eight years old, he mastered riding a bicycle in two weeks. We taught the “preliminary” skills on a scooter, and by the time he got on the bike, he learned to ride—without training wheels. We broke the steps of learning to ride into small parts—or “tag points”—and used the TAGteach method of positive reinforcement. With TAGteach (Teaching with Acoustical Guidance), you set a “tag point,” which is the small, exact behavior you have defined for part of the skill to be taught. When the child meets the goal, you “tag” the success by making a click sound with a handheld tagger. The sound of the tag tells the child he/she met the goal. Follow up the acoustic tag with a small treat/reinforcer for the child. Preliminary skills for bike riding are wearing helmets, pedaling, balancing, and braking. Teaching these skills on a scooter is excellent preparation for bike riding, and the tag points are almost identical! Once your child learns the tag points on the scooter, he/she will be able to transfer these skills to a bike. Put a helmet on yourself and show the child how to fasten the straps. Most children learn to pedal with tricycles. It is easy to teach the action of pedaling with “targets.” Put a colored dot on each pedal. If your child needs help placing his/her feet on the pedals, say, “Foot on Yellow” and “Foot on Blue.” To pedal, say “Push Down on Yellow” and “Push Down on Blue.” Tag and reinforce the correct placing and pushing down behavior. Balance skills are crucial for bike riding. A good way to develop balance is by giving lots of opportunity for physical activity at local parks and playgrounds. For a younger child, simply walking along on an uneven, mulched trail through the woods can be a good way to learn balance skills. Start by showing your child how to hold the handlebar on the scooter; the tag point is “Hands on Handlebar.” If needed, use targets (such as stickers or colored tape on the handlebar) to show your child where to place his/her hands. The next step is to push the scooter while walking alongside it; use the tag points “Push Scooter” or “Walk With Scooter.” Practice these until your child is comfortable pushing the scooter around and can turn the scooter to the left and right. Next, show your child how to place a foot on the deck. This is another place to use targets: put colored strips of tape on the deck, one color for each foot. The tag point is “Foot On Yellow.” Have your child practice placing his/her foot on the yellow strip while holding onto the handlebar (the child may need a helper to hold onto the scooter for this exercise). Let your child practice holding onto the handlebar with one foot on the deck and one foot on the ground. Give the child the time needed to feel completely comfortable with this position before moving on to pushing the scooter. Teach your child how the brake works. Most scooters have a rear fender brake. Place a colored strip of tape on the brake; the tag point is “Foot On Red.” Walk the scooter yourself, and have the child push down on the brake to see how the brake stops the forward movement. Practice walking and braking, and then have him/her stand on the deck and push down the brake. When these tag points are mastered, demonstrate how to put one foot on the deck and push with the other one. The tag point is “Push With Foot.” See if your child can do one push, let him/her try a few times, and then stop before he/she becomes tired or stressed. If necessary, hold onto the scooter while the child pushes. Encourage your child to keep doing the “Push With Foot” tag point (tag and reinforce each successful push), and soon he/she will learn to push and go. Once a child can push and move the scooter confidently, the next step is to get both feet on the deck (again, using the two colored strips as targets) and coast. The tag point is “Feet on Strips.” This may take some time, but it may also come naturally! When your child can coast, turn on the scooter for a distance of twenty to thirty yards with both feet on the deck, and use the brake confidently, he/she will be well prepared for riding a bicycle. Start with this stationary exercise: lower the seat on a small, light bike so your child can easily keep both feet flat on the ground while sitting. If your child’s feet touch the ground, he/she won’t fear falling. Let the child practice sitting on the seat with his/her feet on the ground until comfortable holding the handlebar, balancing on the seat, and touching his/her feet to the ground. Some children may need practice learning how to mount the bike by swinging one leg over the seat. This is a skill that can be taught in another setting: the child can practice swinging his/her leg over a small cardboard box or stool while holding onto something. The tag point would be “Swing Leg Over.” When the child is comfortable with swinging his/her leg over an object, he/she can practice swinging a leg over the bike; if needed, an adult can hold the bike in place. When the child can securely hold the bike alone and swing a leg over, it’s time to move on. To start moving, first ask your child to walk the bike, just as he/she walked the scooter, by holding onto the handlebars. The tag points are “Hands on Handlebars” and “Push Bike.” Make sure the child can turn the bike to the left and right while walking. When the child is comfortable sitting on the bike and can push it along with his/her feet, practice placing each foot on a pedal. Use colored targets again: tag points would be “Foot On Blue,” and for the other side, “Foot On Yellow.” If needed, have an adult hold the bike steady so the child can practice putting his/her feet on the pedals without fear of falling. Once your child is comfortable with lifting his/her feet onto the pedals, the next tag points are “Push Down On Yellow” and “Push Down On Blue” to pedal. This will be the stage where you have to run alongside the child—there’s no way to escape this! The child has to put together all the skills he/she has learned—handlebars, pedals, brakes, and balance—and apply these to the bicycle. It takes all children a while to get the trick of balancing on a bike, but with all the preparatory work above, hopefully you won’t have to huff and puff alongside for too long. My son mastered riding a bicycle in just two weeks. This was the result of all the planning and preparatory work: he knew the helmet was mandatory, he knew how to pedal, and he was an expert glider on a scooter. He was very proud of learning to ride a bike. And your child will be too!